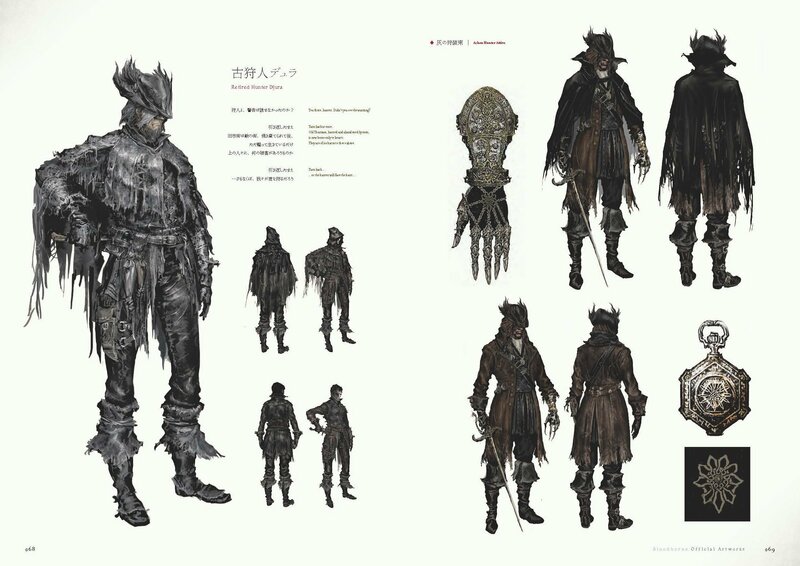 Djura is a non-player character in Bloodborne, found in Old Yharnam. "An old veteran hunter who is said to possess amazing skill. No one has seen him in many years, and he looks like he's been on his own for some time." 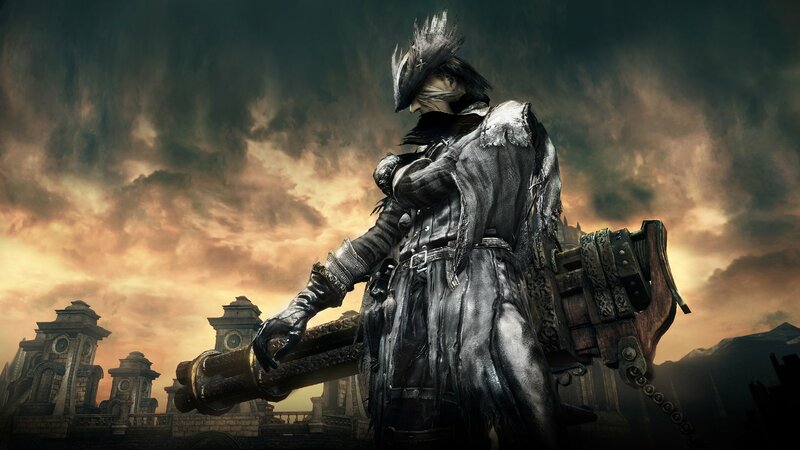 In Old Yharnam, at the top of the tower with the gatling gun. Djura is hostile by default. When Djura is friendly and the player attacks him. When Djura is friendly and the player chooses to "Hunt the beasts of Old Yharnam". When Djura is friendly and the player agrees to spare the beasts, but attacks one of the monsters in front of the tower (including the hunter at the base of the tower and excluding the ravens). When Djura is friendly and a mob in front or at the base of the tower dies for any reason, including fall damage, fire damage, or the player directly attacking said mob. You can befriend him when the Blood Moon is out. See below on how to befriend Djura. 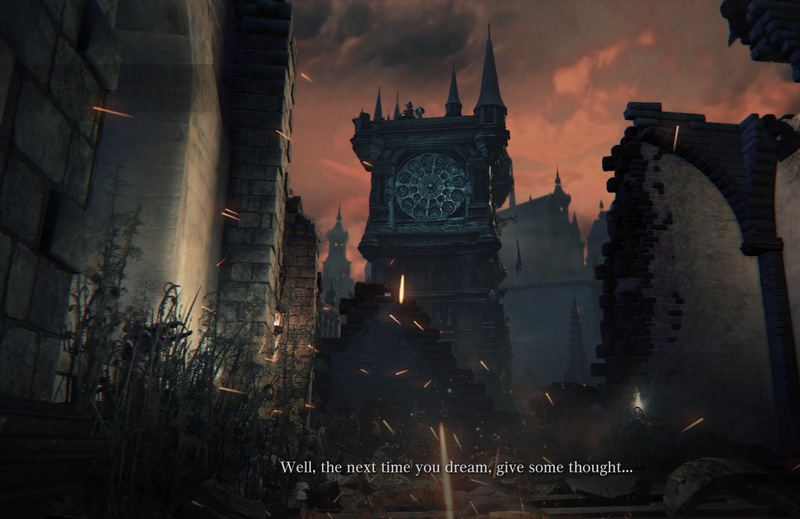 When the player talks to Djura when he is friendly, the player will have the choice to "Hunt the beasts of Old Yharnam" or "Spare the beasts of Old Yharnam". If the player agrees to spare the beasts, Djura will give the player the Powder Keg Hunter Badge and the Brush Off Dust gesture, and remain docile unless provoked as listed below. If the player already has the Powder Keg Hunter Badge, the player will receive a Bold Hunter's Mark instead. Drops: If killed, will drop (875) Blood Echoes and Powder Keg Hunter Badge (which unlocks the Rifle Spear, Stake Driver, Ashen Hunter Set for purchase within the Hunter's Dream). Kill the Blood-starved Beast boss in Old Yharnam to spawn Snatchers. 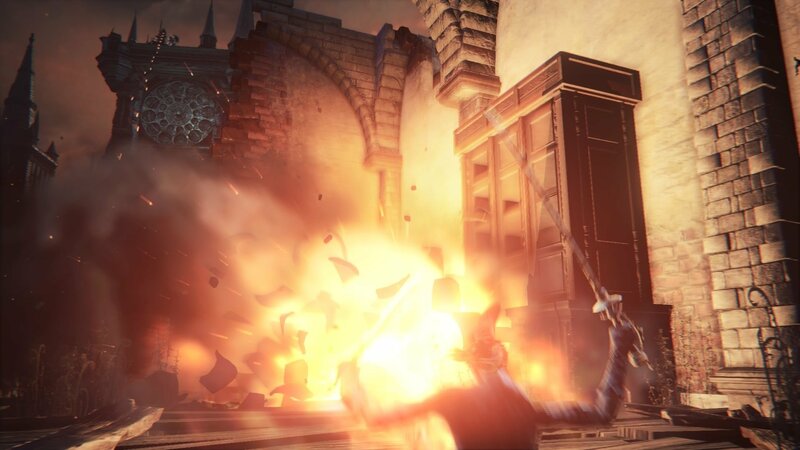 Awaken at the Cathedral Ward lantern, exit straight, look to the right side and get killed by the Snatcher in the corner. After being taken to Hypogean Gaol, make your way to Darkbeast Paarl and enter the boss room. Walk to Djura and climb up the ladder to talk to him. Choose "Spare the beasts of Old Yharnam" and receive rewards. "You there, hunter. Didn't you see the warning? Turn back at once." "Old Yharnam, burned and abandoned by men, is now home only to beasts." "They are of no harm to those above. Turn back..."
"...or the hunter will face the hunt." "...You are a skilled hunter." "Adept, merciless, half-cut with blood. As the best hunters are." "Which is why I must stop you!" "Well, well... How did you get in here? Ah, it's no matter." "What brings you to Old Yharnam? I've no interest in matters further up, but you must not disturb this place." "The beasts do not venture above, and mean no harm to anyone." "If you still insist on hunting them, then I will hunt you first. You understand me?" "Yes, very good. I no longer dream, but I was once a hunter, too." "There's nothing more horrific than a hunt. In case you've failed to realize..."
"The things you hunt, they're not beasts. They're people." "One day, you will see... Hmm, it's time you got going..."
"What is it? Surely I need not repeat myself. Go, I say." "Heheh, you devious rat! The makings of a true hunter, this lass!" "Very well. Then there's no need to hold back! The beasts will feast tonight!" "Of course, I thought as much." "You are a true hunter. Which is why I must stop you!" "Is it the blood, or are you just raving mad?" "When the frail of heart join the fray...the hunter becomes the hunted!" "I should think you still have dreams? Well, next time you dream, give some thought to the hunt, and its purpose." "You still dream I should think? Then come as often as you like, I'll show you another death." "It's you... You're the beast... Can't you see what you're doing? It's madness..."
Djura is an incredibly tough opponent who possesses a very large health pool, be prepared for a long and difficult fight. 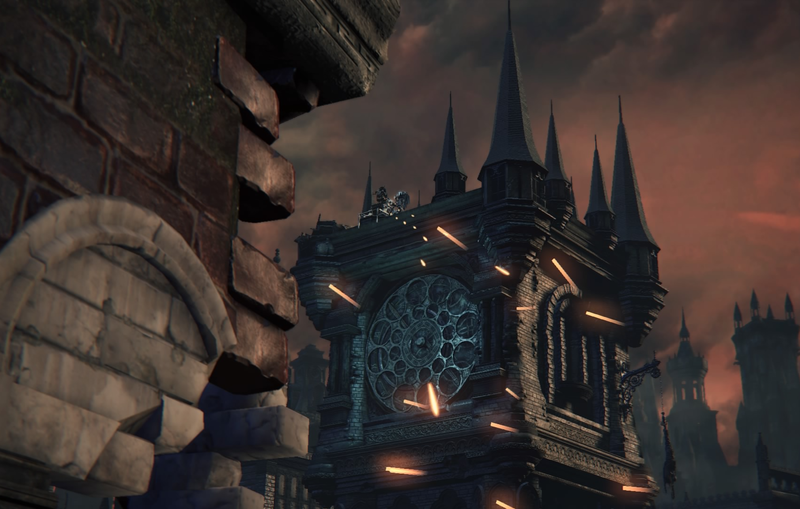 When approaching his rooftop perch in Old Yharnam, Djura will attack the approaching player with a constant volley from his mounted Gatling Gun, which while easy to dodge, can lead to an untimely death if you allow yourself to be distracted by the enemies in the area. Heading towards Djura from the Old Yharnam Lamp simply jump off the ledge and head towards the building he is on top of, there will be a ladder to the left of a doorway leading to a rooftop with another ladder leading to Gyula's perch. Once confronted Djura will switch to a Stake Driver and Hunter Blunderbuss while tossing the occasional Firebomb at his opponent. Djura is an incredibly aggressive and quick opponent opponent giving players very little time to heal or counter his attacks and will do a quick dash attack, which has a very brief charge time, an explosion attack from his Stake Drive or repeatedly fire his Blunderbuss at players who attempt to gain distance or heal. Healing will often lead to Djura using his dash attack. Simply mashing R1 or a poorly timed Gun shot will cause Djura to respond with a Gunshot of his own stunning the player and giving Djura a riposte opportunity which will very likely lead to an instant death even at full health. Djura himself may also be parried, though difficult, and while untested the very brief charge window before his dash attack may be the best opportunity for a successful Gun shot parry. Do not underestimate this fight, Djura is comparable to a skilled human invader in terms of difficulty and the small combat area does little to help the situation. Note: With this strategy, the item he drops is usually not reachable, so reload the game (can be done by dying, going to the Hunter's Dream, or exiting the game) and the item will spawn next to the heavy machine gun. Once you enter Old Yharnam, Djura will start to attack you, and no efforts after will stop the attack other than killing him. Clear out all the enemies up to the first ladder of the Djura fight (you can kill the PK fighter easy by waiting here. He'll do one strike, either a blunderbuss or sword, then retreat. You can bottle-neck his retreat and land massive damage without fear of retribution.) At the top of the tower, make sure you do not hesitate. Stopping on the ladder will allow Djura to blunderbuss you as soon as you get off the ladder. If you charge up and off the ladder, you should roll (important as if you don't, he will repose and combo you) and then R1 him off the edge of the roof. Another possible method is to just climb up the ladder, bait him into following you, and then slide back down. Djura may (YMMV) just fall in pursuit of you (confirmed). When you reach the top of the ladder, stand your ground, Djura should shoot at you from the distance. When he shoots dodge to the side. Djura will then go for you, so dodge again. At this point Djura's back will be to the edge of the building so keep hitting L2 to shoot him off the edge of the tower. Doing it this way will mean he lands on the gantry next to the ladder you climbed up, meaning you don't have to reload to get his items. Once obtained, Beast Roar can effectively be used to knock him off the roof. You can also repeatedly shoot him with a Hunter Pistol until he falls off. This strategy is not guaranteed but is possible. It takes 3-6 shots before he falls or moves out of the way. You can also use a Hunter Blunderbuss, run halfway to Djura, then shoot him twice. Not sure if 100% success rate. The absolute fastest and guaranteed way to knock Djura off is to use the 2-handed Hunter Axe with one running R1 attack. Before climbing the ladder, transform the Hunter Axe into its 2-handed form. As you reach the top of the tower, quickly lock onto Djura during your standing animation, sprint towards him, then use the R1 attack. If you correctly gauge the distance, your running R1 attack will reach him right before he fires his blunderbuss and he'll fall off. Another strategy is to use the Cannon the second you climb up on the top. This will immediately send him flying off the roof, instantly killing him. You may have to reload the area to get the item, as there is a glitch where the item dropped will float at an unreachable height above the bridge below the tower. Djura, to some extent, caters to the beasts that inhabit Old Yharnam. Djura's dialogue suggests that as a hunter, he struggles with an ethical dilemma regarding beasts, and the slaying of them, in general. It is a Hunter's job to slay beasts, but Djura more than likely had an epiphany at some point in his career in which he realized that every beast was once a person, and thus, killing beasts is akin to killing humans. It can be assumed that Djura does not associate with Old Yharnam for any particular emotional reasons. It is likely that he chooses to defend this place, of all other places, because it is remote and unimportant in the world. In his dialogue, he suggests that the beasts here do not bother anyone, and thus shouldn't be bothered in return. In some ways, you could consider Old Yharnam to be Djura's utopia of sorts. And he, quite literally, aims to maintain the peace here. Which raises an important question: who set fire to the crosses at the beginning of the area and around the church? 'Djura' is the Slavic variant of 'George' in English. George, meaning farmer, or earthworker, may be an allusion towards his views of letting beasts roam about in Old Yharnam and rooting out any tresspassers that would cause a disturbance. Djura is voiced by William Houston, the same man who voiced both King Vendrick in Dark Souls 2 and Marvellous Chester in the Artorias of the Abyss DLC for Dark Souls 1. The heavy machine gun is not usable. Djura has 3 companions: one is under his tower, the second in the hunter's nightmare and the last one is unknown, bot it is higly possible that he could be Beastclaw Jozef, since he wears the Charred Hunter set like all other Djura's companions and he's found in Loran dungeon, a place were there are beasts similar to Old Yharnam's. He will still befriend you even if you aggro him (he shoots at you) when you pass through the first time as long as you don't kill him and then enter the Darkbeast Paarl boss room. I used both a Bold Hunter&apos;s Mark and died to Paarl (Two different attemtps) and I always reawaken at the place you appear in when the Snatcher gets you. I was really excited to befriend Djura today. It was my pick-me-up to try to make a really*****ty day a bit better. I made a mistake though. I just ran past the enemies in the the church on the way to Djura&apos;s ladder. Apparently, just tapping your foot against a beast while climbing down the ladder (and not even doing damage!) is enough to make him hostile again. I wasn&apos;t expecting to be called a rat. Pick-me-up failed. Should have warped, hindsight is 20/20 and all that. I gone to the top of the tower.when he charged toward me i put bone marrow ash on my canon and shoot him.poor guy throw up like a ball. He was never that hard for me, I just used the Hunter&apos;s Axe two-handed and hit him with an L2 when I dodged, then backed off, rinse and repeat. I was messing around, doing invasions in old yharnam, and I encountered this guy using an upgraded burial blade. This guy could kill me in two hits, so after invading his world a few times and dying, I realised that I wouldn&apos;t be able to kill him normally. So, I tried to lure him into fighting a mob of enemies, but then two summons entered his world. So, after they died to djura, I relized all I had to do is trick him into being within djuras range. So, after almost dying a few times, I got him to chase me just a few feet away from the border of djuras range, and with a riposte and some hunter pistol spamming, I got this guy right into djuras range. Thank god this guy exists. He killed himself by back stepping off the ladder. My theory all the time - From the first time starting up the game years ago until today - is, that we are actually seeing***** that just isn&apos;t there. The human in the first part of the game are all patrolling the streets, half turned into werewolfes - but they are SCARED of you. They call you a beast, shout "away, away!" and seem to be afraid to the bones. You kill them because you see them as mad half transformed monsters - But are they? Or maybe it is that weird bloodcurse that make them LOOK like monsters ? Maybe you are the monster after all - and all those horrible creatures you see through the game are actually just people. That would also explain the "Insight" and how it changes what you can see around you - It is you drifting into madness even more. The "hunt" is some special blood moon night in which those who are cursed with the blood start to halluzinate and kill each other in the most gruesome ways. Maybe Djura acknowledged that - Maybe he understood. That is why he tries to stop you. I really think that Djura is right in spare the life of the beasts. I mean, the Healing Church never tried to deal with the beast that wasn&apos;t "kill or make more bizarre experiments with them." They never hyphotetized that they could heal (ironically) the beasts. The only "heal" they were concerned was for themselves, for they transcend the humanity, while the rest of the people has collapsed in madness. Laurence, Ludwig, Micolash, Lady Maria, Gehrmann, they all didn&apos;t care about the people, and yes only with your greed. And in this well of greediness, only Djura saw that the people of Yharnam deserved to be saved, because it was the main viticm of all that insanity, not the villains. if i didn&apos;t already know i&apos;m***** djura&apos;s voice would&apos;ve probably been my awakening. who let this old man have a voice like that. So I went through and killed blood starved beast. Completely ignoring djura and never walking up to him. After blood starved beast I killed vicar, the witch, and then went for paal. After killing paal I then went to meet djura. But he was gone and only his badge was there? Does that mean he is dead? And how? Unless one of the idiots I summon via hunter bell killed him idk were he is. If i run to the tower without killing any beast? He will be friendly? Killing the Blood-starved beast to befriend Djura is optional. 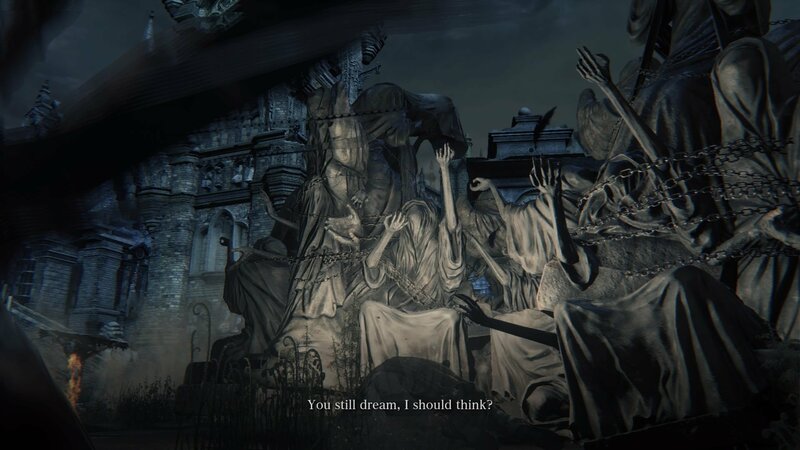 You don&apos;t even have to enter Old Yharnam from the main entrance, simply progress the game by killing the Cleric Beast and skip BSB till you reach Yahar&apos;gul and then killing Darkbeast Paarl. Djura will be friendly. Pardon me, but the full quote is: "But remember one thing, you&apos;re not hunting beasts... its you, you&apos;re the beast, just think about what you&apos;re doing... its such a madness..."
"Djura has no association with Old Yharnam--" uhh what. Djura is an Old Hunter, from the time of the decimation of Old Yharnam. He alone was able to resist madness and see through the illusions of the hunt, and discovered that the beasts were still human. We even meet one of Djura&apos;s companions in the Hunter&apos;s Nightmare, protecting a cave of beasts while wielding the same fashion of gatling gun as Djura uses, evidencing further that Djura is a man from the past. I don&apos;t know if this is a bug or not, but I cleared the whole Old Yharnam area and killed Blood-Starved Beast. Of course, he turned hostile and killed me twice. I left him until I killed Darkbeast Paarl and found the back door, and decided to fight him, but he was friendly, and even gave me the mentioned rewards. I don&apos;t know how. Maybe it is because of the Blood Moon?! 1. Visit darkbeast paarls room. 2.kill the blood starved beast. Now you can clear the path to him but before going up the ladders. Return to the darkbeast shortcut door. Even if u havent opened it yet. Press x on it anyway. Then make your way to djura. He should remain freindly, found this whilst farming shards. He quit as a hunter and doesn&apos;t want to kill beasts since they were once human, but he has no qualms killing humans like you? On my second character I was ready to face the hunter at the base of the tower to collect the bone morrow ash from him since I&apos;m running a skill\blt build this time but as so as he charged at me Djura open fire and killed him in an instant had no idea that could happen.